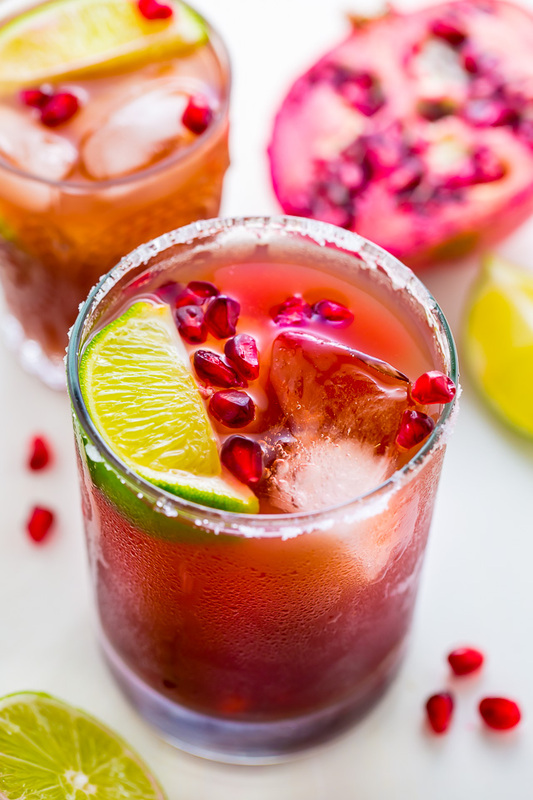 Celebrate happy hour at home with these Easy Pomegranate Margaritas! Made with just 5 ingredients! Hallelujah and Happy Friday! What are you up to this weekend? What ya baking? I have pizza dough rising as I type. I’m making my favorite Sicilian pizza for dinner and (finally) photographing it so I can share it with you tomorrow. Also baking 8 new recipes this weekend before heading to NYC to spend a few days with my girl Tessa. So basically tons of baking and eating (and dish washing) in my future! But before all of that: let’s share a quick cocktail! 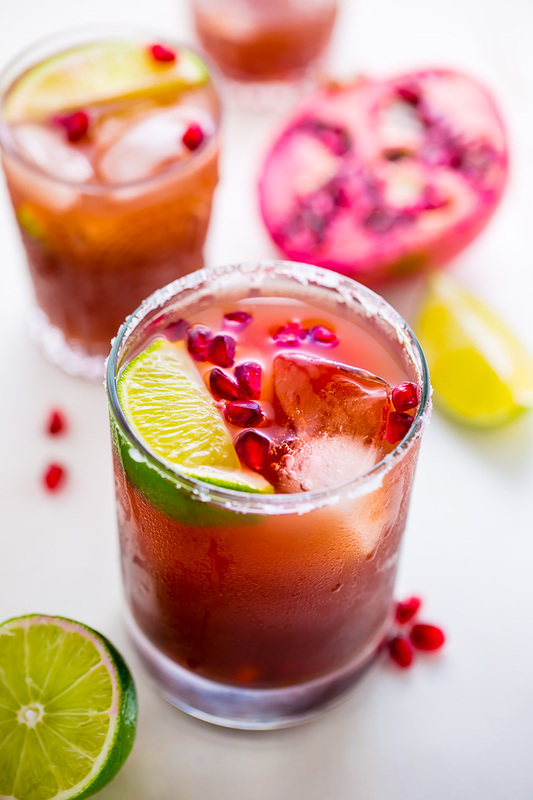 I made you some super tasty, super easy pomegranate margaritas. They’re fresh, fruity, and perfect for parties… or just a cozy Friday night home. Toss all of the ingredients together, give em a stir, and serve. It’s really that simple! 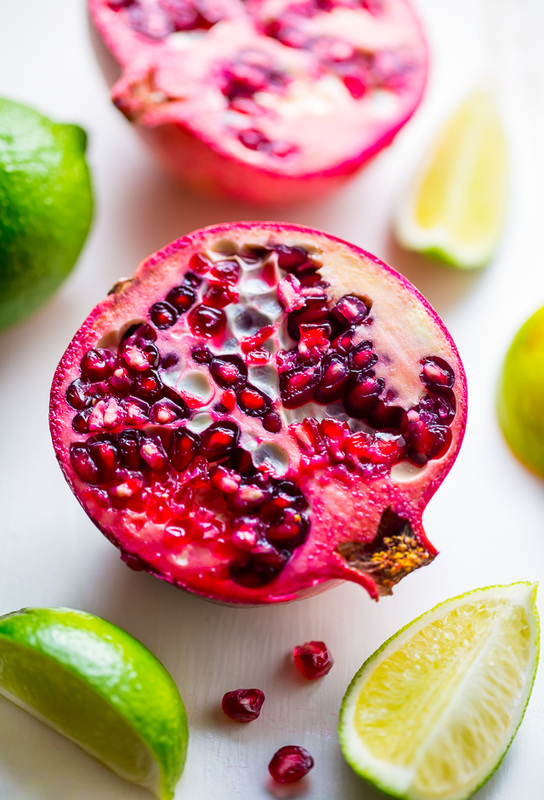 For an extra pretty presentation, top each margarita with pomegranate seeds and a lime wedge! Since there are only a few ingredients in this recipe, I suggest using the best quality ones you can find. I LOVE Casamigos for the tequila and Cointreau for the orange liqueur. Both are pricey, but last a long time and taste wise are totally worth it! Of course you can use basic tequila and triple sec, but it won’t taste nearly as good. Do what best suits your tastes and wallet! Use FRESH lime juice. It’s a million times better than the bottled stuff. I prefer these easy pomegranate margaritas on the rocks, but you could definitely add ice, blend them, and serve them frozen. An easy recipe for Pomegranate Margaritas! Only 5 ingredients. Ready in less than 10 minutes! 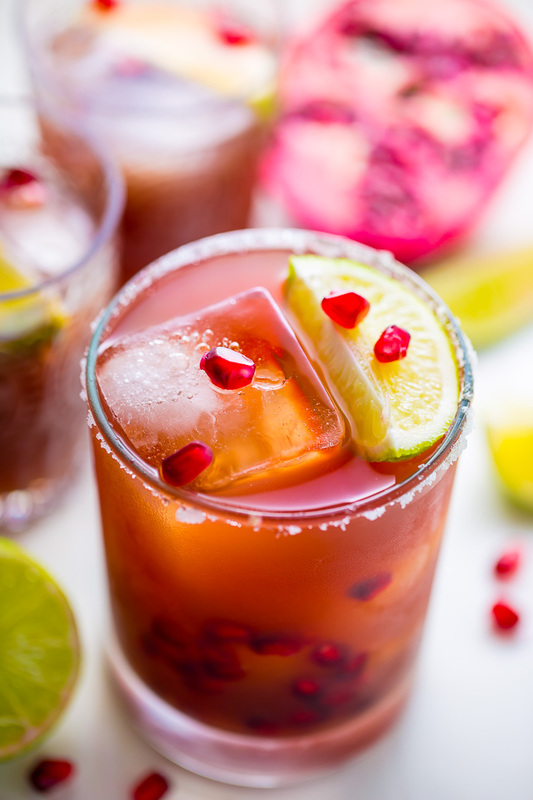 In a pitcher add the pomegranate juice, lime juice, tequila, and Cointreau (or triple sec) and mix until well combined. Taste and adjust if needed (more juice, more lime, more tequila, etc). Divide among ice filled glasses, and garnish with pomegranate seeds and lime wedges. Serve at once. Love this wintery version of a marg, who says you can’t enjoy them any time of year! Have the BEST time in NY, are you going for a fun getaway or is it work/blog related? Ahh either way I’m jealous, need to get back there this year!